14 Apr 2018 / 09:43 H.
QUITO, Ecuador: Ecuador on Friday confirmed the deaths of two journalists and their driver who had been kidnapped by renegade Colombian rebels – and quickly launched a retaliatory military operation in the area where they were snatched. Bogota also sent troops into the dense jungle border zone where the remnants of the Revolutionary Armed Forces of Colombia (FARC) rebel group operate – a key point on the trade route for drugs destined for Central America or the United States. The killings – after what is thought to be the first such abduction of journalists on Ecuadoran soil in three decades – have shaken a country unaccustomed to the cruel violence linked to trafficking that has ravaged Colombia. The three men, who worked for the influential El Comercio newspaper – were kidnapped on March 26 while covering a story on violence along the border, where Ecuadoran forces have been battling Colombian rebels engaged in drug trafficking. Reporter Javier Ortega, 32, photographer Paul Rivas, 45, and their driver Efrain Segarra, 60, were snatched in the coastal region of Mataje on Ecuador's northern border with Colombia. 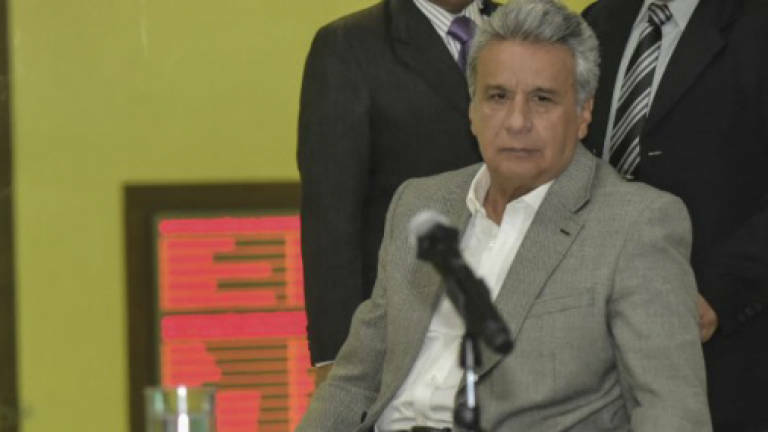 Ecuadoran President Lenin Moreno had given the kidnappers a 12-hour window to provide proof of life for the trio, but that expired on Friday and he announced their deaths shortly thereafter. "Sadly, we have information confirming the murder of our fellow countrymen," Moreno told reporters in Quito, some of whom broke down in tears, while others exchanged embraces. He then sent troops into the border zone. "We have resumed ... military and police operations in the strip of land by the border where they were previously suspended and I am immediately sending in a deployment of elite units from the army and the police," Moreno said. Ecuadoran officials believe the hostages were taken into Colombia and have made contact with both the Catholic Church and the International Committee of the Red Cross for help in "immediately starting" the process of locating their bodies and bringing them home. Speaking in Lima, where he was attending the Summit of the Americas, Colombian President Juan Manuel Santos denounced the murders as "a deplorable act", confirming his troops had also been sent in. "We have already started operations on the Colombian side of the border as they have in Ecuador," he said, while insisting the abduction "happened in Ecuador" and was led by an Ecuadoran national. Ecuador's military has blamed the abduction on the Oliver Sinisterra Front, a group which counts between 70 and 80 rebels and is headed by Walter Artizala, an Ecuadoran in his 30s who goes by the name "Guacho". A former FARC rebel with expertise in explosives, drug smuggling and financing, Guacho is one of the most wanted men in both Colombia and Ecuador. "We have included the drug-smuggling terrorist Guacho on Ecuador's most wanted list and we are offering a reward of US$100,000 (RM388,000) for any information which leads to his capture," Moreno said. According to Colonel Polibio Vinueza, who heads the police's anti-hostage unit, Guacho had been in touch with the Ecuadoran authorities "since April 7, using WhatsApp" with the aim of reaching a deal to swap them for three rebels held in Mataje on trafficking charges. But as his own boss, and without anyone to answer to, the rebel chief could change his mind on a whim, "depending on circumstances", Vinueza explained. Late Thursday, a visibly emotional Moreno had issued an ultimatum to the kidnappers after his government received photos from a Colombian TV station suggesting the three were dead. Cutting short a trip to Lima for the Americas summit, he hunkered down with his cabinet to handle the crisis. But as his 12-hour deadline passed, news of their fate became clear. The murders were roundly denounced by governments in the region and beyond, with Costa Rica expressing its "absolute condemnation" of the bloodshed and Spain denouncing it as a "vile and criminal act". The announcement draws a line under a 19-day nightmare for the families, with information emerging on a piecemeal basis and often skewed by rumor and falsehoods. "This is very painful because we had faith and hope that the team would be found alive," said Alex Llanos, a journalist with Ecuador TV as a group of people held a vigil outside the government building in Quito.